When I decided to set my crime novel - PROHIBITION - in the 1930s, I knew I was taking a chance. Many publishers believe that any literary gold has been mined from that era long ago. Some readers don't like period pieces. I knew I was running a risk that my work would be called unimaginative drivel. Repetitive. Pastiche. Fan boy fiction at best. Why? Because I believe that if the period fits the story – and not the other way around – there’s nothing wrong with a period piece. Good story telling is good story telling regardless of setting. But why did I pick the 1930s in the first place? I suppose it’s because I grew up listening to my grandmother – who was born in 1902 – talk about how she’d lived through two world wars, the Roaring Twenties and raised a family through the Great Depression. She told me that she’d grown up in the same neighborhood as Jimmy Cagney, but was always very clear that they weren’t friends. She said she only knew him by reputation and from around the block. That sort of honesty struck me. I was only five years old at the time. She could’ve told me anything and I would’ve believed it. But even at a young age, I could tell she went to great lengths to be honest in whatever she told me. That said a lot about my grandma. And as I got older, I wanted to know more about the time she’d talked about all those years before. The urge to learn more about that period had already begun to take hold. Of course, movies are an easy place to start. I’ve always loved classic movies, especially the gangster films of Cagney and Robinson and Raft. (Bogie, too, but he always struck me as lacking the authenticity the other three had. I later learned he grew up in an upper middle class family in New York City, which explained why he never quite hit the mark for me.) And while glossy portrayals of the era like Guys and Dolls make me cringe just as much as the plastic portrayals like The Untouchables in the 1950s, I knew they were movies, not documentaries. They’re meant to make money by entertaining. Accuracy and educating was a distant concern, if it was a concern at all. These shows couldn’t be considered a historical record by any means, but they were a good place to start. When the seed of the Quinn character (my protagonist in PROHIBITION) began to take root, I decided to do some digging into the period on my own. And since I began writing PROHIBITION before the invention of e-readers, said digging meant books. Lots and lots of books on the period. On the Prohibition era in general and on Prohibition in New York in specific. I’d first envisioned PROHIBITION as a gangland epic about the battle of control of New York City in the mid-1930s. In the course of my research, I discovered history was far more interesting than the hats-and-gats drama I’d planned to write. My research made me realize it would be better to focus on the era before the gang wars that gave Luciano and Lansky their rise to power and focus on the calm before the storm. I set my story in 1930 because it was toward the end of Prohibition and the dawn of the Great Depression, when New York was a city at a crossroads. I decided that I could get more dramatic lift out of setting my story in this lesser known time period. The moral of the story? Research might not be the most exciting part of the writing process, but it can be the most important. Terrence P. McCauley is an award-winning writer of crime fiction. 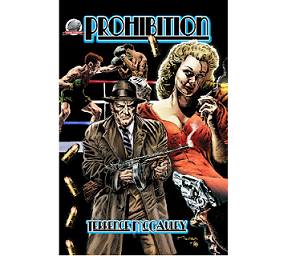 His first book, PROHIBITION, published by Airship 27, is a full-length novel set in the colorful, exciting world of 1930 New York City. Terry Quinn is an ex-boxer turned mob enforcer who must use his brains instead of his brawn to figure out who is trying to undermine his boss's criminal empire and why. Quinn's boxing career will be featured in a prequel - FIGHT CARD: AGAINST THE ROPES - published by Fight Card Books in 2013. 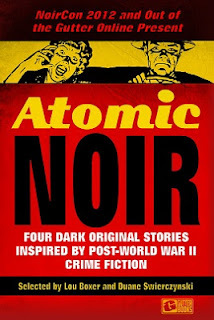 Readers can enjoy more of Quinn's adventures in short stories featured in Thug Lit - Volume 1 (LADY MADELINE'S DIVE), Action: Pulse Pounding Tales, Volume 1 (BLOOD MOON OF 1931) and in Atomic Noir (A BRAVE NEW WORLD). A proud native of The Bronx, NY, he is currently working on his next work of fiction.